A few weeks ago I had the special honor of getting to commemorate the 50th anniversary of Star Trek, held at the Smithsonian’s National Air and Space Museum in Washington, DC. I was so psyched to get to be there that I Photoshopped a picture from a classic Star Trek fan favorite of Kirk, Spock, Doc, Uhura, and the entire crew on the Bridge of the USS Enterprise. You might think because Sulu was an Asian American that he would be my favorite. Because as a kid born and raised in the US, I often felt cognitive dissonance whenever Sulu spoke. Over time I had come to accept that all Asians on TV had to have a funny accent—so as a kid I thought, “Was something wrong with Sulu? He speaks perfect English.” He talks like me. Weird. But, instead of Sulu, Scotty was the one who I idolized. Scotty could fix anything. He was an “engineer”—I didn’t know what that meant at the time. But he’s the reason I went to MIT to study and become an engineer. Anyways, the night prior to the 50th anniversary event, I was just so proud of myself. I Photoshopped my own face on top of Scotty’s, to wear his red Engineering shirt to stand with the rest of the crew on the Bridge. I showed the freshly edited photo on my iPhone to my college-age daughter who knew a little about Star Trek. She said, “Cool, dad. I like space.” And then I showed it to my 10-year old daughter who looked at the photo carefully and quietly. Not knowing anything about Star Trek, and because she had just overheard that it involved space and thinking it was new, she squinted at the screen and asked, “Is that Dr. Mae Jemison? We just studied her in school.” She was of course referring to Nichelle Nichols playing Lieutenant Uhura. It was a strange moment. Because it was the exact reverse of the kid who thought that Sulu was talking weirdly—for speaking normally. Because for there not to be an African American astronaut like Dr. Jemison in the photo it would have been weird for my daughter. It made me think of how a photograph from the ‘60s of an implausible fictional world that Roddenberry had imagined—one where Dr. Martin Luther King Jr. went so far as to ask Nichols to not leave the show after its first season to pursue her career on Broadway, saying to her, “What you accomplish for us will only be real if you stay.” It is profound how Dr. King correctly predicted Nichols’ presence on national television in the ‘60s could become a statement of logic and plausible fact 50 years later to a child in the 21st century. And of course to become the real inspiration to not only Dr. Jemison, but to NASA Administrator and astronaut Maj. Gen. Charles Bolden and to many other African Americans in the sciences. Gene Roddenberry foresaw a world of inclusivity 50 years ago, and by helping us see it, let us grow to become it. I then recalled another time where I felt Mr. Roddenberry’s touch—it was at MIT during the ‘90s, when I was a professor there. I couldn’t help but wonder if Dr. Vest, after a long day of meetings at MIT, would go home and on occasion might watch Star Trek: Voyager. And if there he saw a future that he needed to lead and create–and in turn, make it so. It is 2016, and after a career as a professor at MIT, as president of an art college, as a partner at a Silicon Valley venture capital firm, I’ve taken on a new role to serve the vision of Open Source at Automattic. The founder and CEO, Matt Mullenweg, is also cofounder of the popular Open Source blogging system WordPress. I noted recently that he was born in the same year that I began at MIT as a student, in 1984. You know, these days when you read about Millennials or the “techies in Silicon Valley,” and if you are a little older and supposedly wiser, you can’t help but join in and toss snark or other insecurities towards the younger generation. You can’t help but see “them” as clueless, and desire to stand authoritatively in the comfort of cynicism that you’ve earned with age. You see, Automattic (spelled with two Ts) is one of those “weird” tech companies. It’s even weirder because it is a completely distributed company—there is no central office or offices—it is 500 people across 50 countries. We are all working to make the world better through Open Source and WordPress. 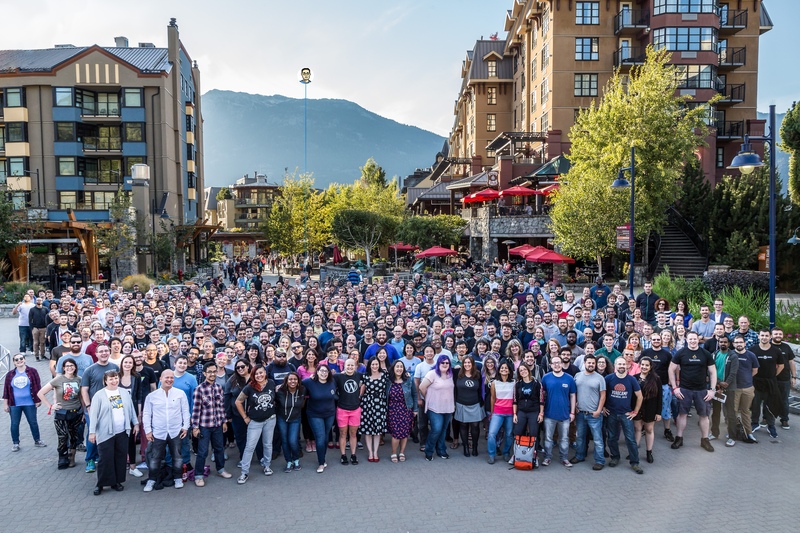 Each team within Automattic has a distinct name—there is no convention to the team names. There are names like Cerulean, Delta, Slytherin—the team names make absolutely no sense, and there is no pattern. And Matt’s team is called “Bridge”—it supports bridging and connecting all the teams in Automattic. On the day of the Star Trek 50th anniversary, and just a few hours before I was going to walk to the Air and Space Museum to deliver my address, I received a coincidental DM from Matt. He noted to me that I had just finished my onboarding for all Automattic employees of working in customer support (or “Happiness Engineering” as we call it), and that he could now officially invite me to the Bridge team. It was definitely a “drop the mic” moment. Because I was being formally called … to the Bridge, while I was walking over to celebrate 50 years of the bridge of Star Trek. So I asked Matt if the naming of his team had anything to do with Star Trek, and you can easily guess his answer. It reminded me how Mr. Roddenberry’s vision and optimism continue to engage each new generation, and I have gotten to see it especially in the startup community these days. For it is by my most recently working in the venture capital world at Kleiner Perkins where I learned how: Pessimism loves company. But optimism makes companies. My closing thought at the Star Trek 50th anniversary event was how I owe it to Gene Roddenberry for envisioning for me, and for all of us, a world that can be #BoldlyBetter. And to make us rethink how “weird” is only felt that way when we are forgetting to be inclusive of another person’s way of thinking or way of being. Because luckily we know that we’ll get really inclusive in the future, with even aliens too, at least by the 23rd century as envisioned in Star Trek, but we can certainly start right now. So, I got to see my fellow Bridge team members for the first time last week at my first Grand Meetup—where Automattic employees convene from 59 countries all over the world to coordinate, resynchronize, and take on 51 weeks of remote work as one giant team. Our head of Happiness Engineering, Andrew Spittle, has big dreams for expanded support (and happiness) for our growing customer base. Our head of Business, Catherine Stewart, sees new ways by which the various parts of the Automattic universe can provide enhanced, sustained value for folks who choose the WordPress ecosystem over other alternatives. Our CMO, Chris Taylor, has exciting visions for what our brand currently is, and what it can become. And our CEO, Matt Mullenweg continues his optimism in the power of Open Source as a primary force to counteract the compartmentalization of the Internet into walled gardens, and now more like walled cities and countries. Matt’s vision of Open Source has been something I have truly come to believe in. Especially because I realize that Open Source, at its fundamental levels, is all about inclusion—it’s about always asking the question, “Who am I excluding?” or “Who have I excluded, and need to go back and include.” And then setting forth to make things right by thinking, and acting, as inclusively as possible. I’ve personally realized the impact that is possible by being a man who chooses to take action on behalf of women’s issues (its importance noted in the recent MIT conference on STEM with US CTO Megan Smith in the section “Men as Allies”). It’s true that as a male, if you are invited to a panel and notice that there are no non-males or transgender participants on the panel with you, that by telling the organizer that you either refuse to join the panel unless they change their biases or suggest another non-male in your stead, they will usually (and immediately) comply with your suggestion because they simply weren’t aware of their own unconscious biases. And in addition, I will be continuing to leverage the fact of my being an Asian American for people of all ethnicities and races (see “Did I Grow Up And Become The Yellow Hand?”), and also for people who are older in tech too, because I am 50 after all (smile). To miss this one, all-important fact would be a true lack of inclusion: in my journey to fully embrace inclusive principles, I have seen my greatest allies in the challenge to achieve greater inclusion in our world to be straight, Caucasian males who are fully awake, or are just starting to become awake. And those who are awake are not limited to people of this generation, for they include great people like Abraham Lincoln, Eleanor Roosevelt, and countless others. Today, you know who you are, and you are doing such important good in this world—I am proud to serve in this mission along with you. So in closing, within a strong global political mood of pessimism that is being lobbed at our future, at each other, and from all directions, I’ve seen instead at our Grand Meetup last week within a company that champions Open Source and the motto “We don’t make software for free, we make it for freedom” a profound sense of optimism. It feels a lot like the optimism I felt back when watching more than a few episodes of Star Trek, and to feel like boldly going where no human has gone before! What’s it like to serve on “the bridge” of an invisible, completely virtual starship, and to enlist and side with the Next Generation? Stay tuned. John, it was great meeting you during Automattic’s Grand Meetup. I love how you stand in the intersection of design, inclusion, and open source. As WordPress reinvented the web, and now Automattic is reinventing work, I look forward to have you lead us in redefining design and inclusion. Thanks for the inclusivity. Sometimes I feel left out of humanity’s pairing these days. I am LOVING this blog. I am a designer, artist, and marketing manager leading my creative team as well as teaching organizations how to be inclusive. This intersection speaks to me. Indeed Star Trek comes up frequently as an example to get conversations about inclusion started.